It would have been pretty hard not to have woken up at Balezino this morning. 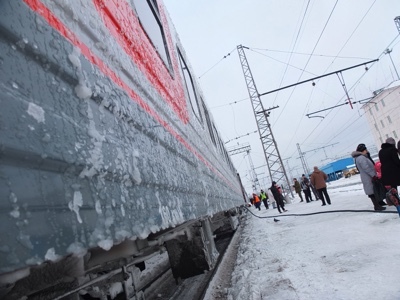 05.27 Moscow time, still dark outside and the first chance of the day to smash the accumulated ice off the underside of the train. 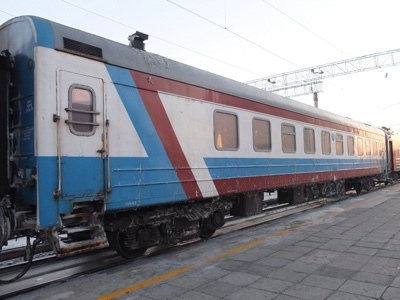 In case you are not familiar with this, in Siberia at every stop every carriage has to be whacked repeatedly with a huge metal bar. There are some manly men resident in the train who do things like this, but it seems anyone with a big object is welcome to join in. I tried to stay in bed, but the combination of bogie whacking, barking dogs and platform announcements conspired to get me up before the sun. Edit – Larissa has an axe for this job which she keeps warm by keeping in it the fire closet for the samovar. Note to self, try not to upset her! I had a mild panic as my window was slightly open and this would be very visible on the platform to the Provodnitsa. I have sealed it up for the day now – let’s hope it’s okay. It’s actually a fairly stable 23 C inside, so not as uncontrollably hot as I have previously known. I think this type of carriage has temperature controlled air conditioning. During the night I spotted a flashing amber light above my door and in a confused state concluded that this was a low temperature warning light to alert the Provodnitsa of my illegal window opening activity. It was in fact just the standby button on my television! I’m not sure how many miles east we have covered in the first 18 hours of the journey, but looking outside its pretty Wintery now in a European sense, with endless deep snow, fir trees and telegraph poles. 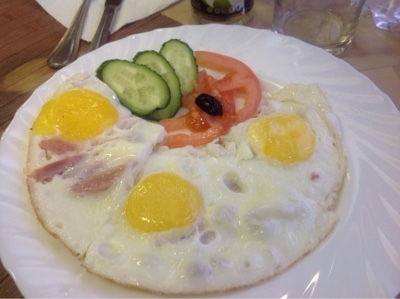 I took a solitary breakfast in the restaurant carriage. When you leave carriage 6 you step back about thirty years as the restaurant is from a different time. For such a big train you would think it would be busier, but many passengers bring their own food or buy it from the platform shops. The prices seem pretty reasonable to me, but that’s mainly due to the weak Ruble. There is an eastern looking chef and a Russian couple who run it, I’m assuming as a franchise. The lady is pretty cheerful (for a Russian) and I have actually managed to get a smile out of her today. I have so far met one fellow passenger who speaks English. He is a South Korean business student called Kim. His name is actually Kim something, something, but he politely allows me call him “Kim” recognising my lack of Asian language skills. Like me he hopes to catch the elusive DBS ferry to his home country next week. 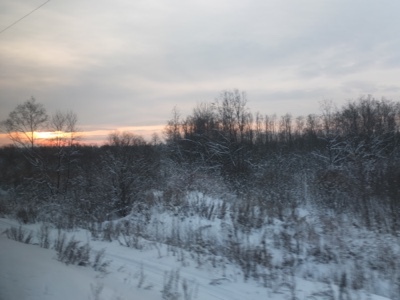 No sign of any tourists on the train, but that’s no surprise as (a) it’s Christmas Eve and (b) it’s a train to Vladivistok in the middle of winter. Kim thinks I will be the only western person getting on the ferry. I have just been given a card that locks my cabin door. High tech stuff. That clears up my question about what the weird red button inside my compartment does, but I wonder why it took nearly a day to give it to me?